CMMS software also logs maintenance and repairs records, locates the parts or materials required, tracks associated costs and manages related workflows. All these CMMS software features improve your the overall productivity of your organization by reducing the downtime normally associated with equipment-related tasks. Not sure where to start? Check out our survey to see what other CMMS buyers requested in recent months. As soon as you enter data into your CMMS, it becomes available for any reports or analyses you request. Asset information becomes part of the database, and any potential problem it reveals automatically generates an alert to the manager of the maintenance department. The alert also offers recommendations for solutions. Once the job is completed, the technician enters the information regarding the work itself, the time-frame, any parts or materials involved in the repair and the labor data. The system draws on this information to support future maintenance and repair scheduling. The best CMMS platforms also facilitate customized analyses. You can specify parameters for your specific industry or your company’s unique requirements. Another customizable function of computerized maintenance management software is oversight of work orders for the maintenance and/or repair of assets. The system automatically generates work orders according to a preset maintenance schedule and responds to repair requests entered by your authorized personnel. You can configure your CMMS to request approval for either type of work order, or you can allow it to automatically issue the orders to your maintenance manager. You can identify filters that route the request by user, by contractor, by urgency or by priority. You can also put a customized workflow into place that standardizes all of your maintenance and repair request processes. The system organizes work requests by codes and assigns each one a number so that you and your maintenance crew can locate it quickly if needed. Then, CMMS tracks the progress of the work request, from issuance of the order through the planning, scheduling and completion phases, ensuring timely and effective follow-through. The purchasing module is integral to CMMS functionality. Once the need for a specific repair or maintenance action enters the system, the purchasing module initiates a materials and parts requisition to supply your maintenance crew with the items it needs to perform quickly and effectively. If a key item is temporarily unavailable, the system automatically issues a notice to the maintenance manager, who can then adjust the work schedule accordingly. Without this type of control, unexpected delays often cause problems. The purchasing component of CMMS may also include a master parts catalog. Most systems offer forms and functionality for purchase orders, invoices, receiving and returns. The ability to predict equipment issues or failure gives your maintenance crew a chance to solve problems before they occur. Accessing the necessary information from its archives, your CMMS system bases its predictions on hard data. It monitors your equipment to collect real-time data to predict emergent issues. Then, it cross-references this information with historic data to pinpoint potentially imminent problems. Predictive maintenance is not strictly precise, but it is an important function that can be extremely helpful in keeping your equipment issues to a minimum. Cloud-based CMMS software helps you to actively manage assets across a number of business locations in real time. You and your maintenance manager have access this information from any connected device, so you need never lose track of your valuable equipment. The system curates such information as maintenance records and scheduling, service contracts, calibration points, safety certifications and procedures, meter readings and inspection requirements. It also tracks the specific location of each asset, plus any equipment failures, error codes and downtime. Your system uses asset management information to generate reports, make recommendations regarding repair and replacement, and to create work orders for general maintenance or emergency repairs. It also bases scheduling on equipment locations, usage and condition. An updated inventory of maintenance materials and repair parts keeps your service department apprised of supply shortages that affect daily scheduling. It tracks the physical location of these items, facilitating quick transfers between multiple business locations. This CMMS functionality also gives authorized personnel instant access to determine availability and cost for any item. It can provide vendor information such as location and ordering terms. Also, top inventory management software can make suggestions for alternative parts or materials when the items your maintenance department needs are unavailable. As your employees use parts or materials, the CMMS inventory module adjusts its totals accordingly, and when the supply of any particular item runs low, the system alerts your purchasing department. This ensures that when a technician must make an emergency repair, the parts are available on the spur of the moment, and the equipment will be back in service without costly delays. If your business has assets that need periodic maintenance and daily management, a CMMS system will be a valuable addition to your firm. It works behind the scenes to ensure that your equipment is trackable, in top condition and provides effective service longer. Have you ever wanted a robot butler to help you with your chores? A computerized maintenance management system (CMMS) is the software version of that idea. Users can utilize CMMS functions to streamline workflows, track work orders, schedule preventative and repairative maintenance and manage assets. 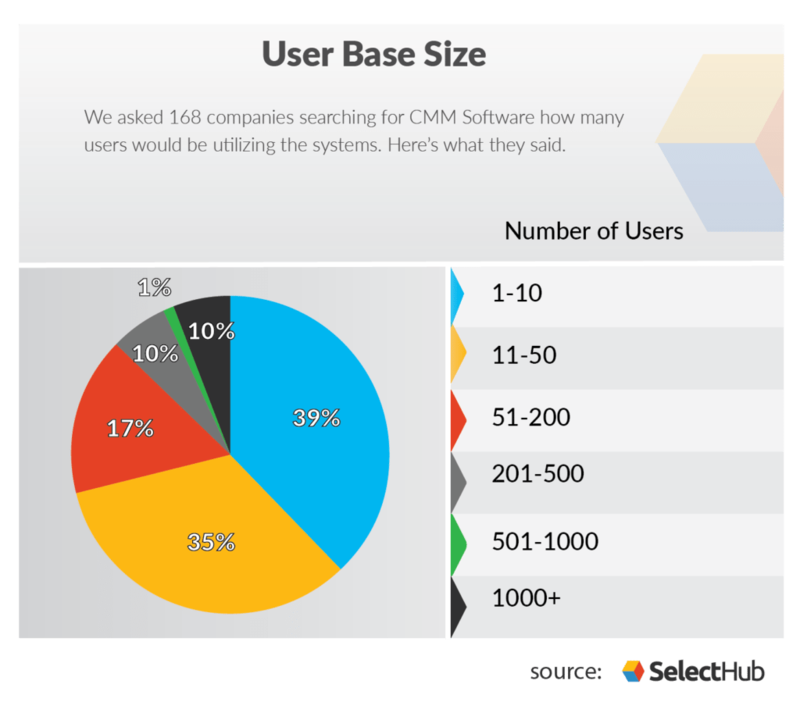 Over the last year, we asked 168 companies in the market for CMMS software what features they were looking for. Here’s what they had to say. Buyers want to know what’s coming through features that offer management, preventive and predictive maintenance. Buyers want control with management features and better security options. Most buyers want the basics, and either don’t want (or don’t understand) some of the more advanced features. 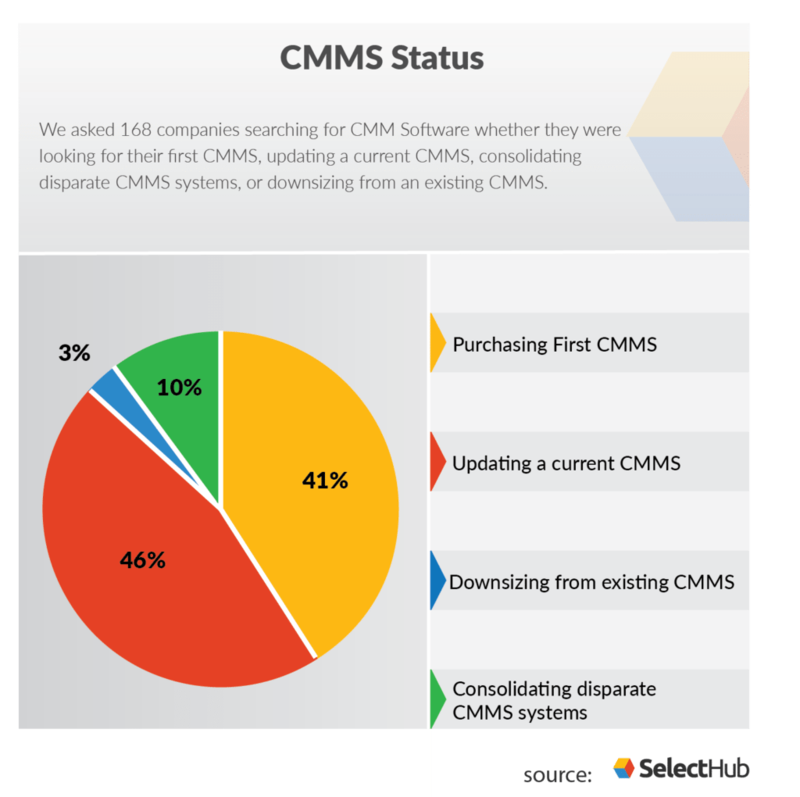 Buyers in the market for a CMMS system aren’t satisfied with fixing problems as they come up. They wouldn’t be looking for CMMS if they were. But their desire for preparation goes beyond the preventive maintenance feature that 71 percent of respondents asked for. Buyers want to be on top of everything: work orders (86 percent), inventory (71 percent), assets (69 percent), purchasing (23 percent), fleet (7 percent) and facilities (6 percent). Another 23 percent wanted predictive functionality that would forecast future maintenance needs and potential pain areas so they can anticipate issues before they arise. CMMS expert Fred Schenkelberg isn’t surprised by this finding: “CMMS systems can be very simple work order planning, scheduling and tracking features, yet become valuable tools when used for preventative and predictive maintenance. It is good to see both preventative and predictive maintenance in the top ten list of request features.” Users not only utilize but expect and depend on the preparative, predictive and preventive CMMS systems features. CMMS buyers are searching for options that will give them more control of their operations in a variety of nuanced ways. As I mentioned, they want a more controlled process for work orders and asset management, along with specified management features for facilities, fleet and inventory. But buyers also want control over the system itself: 13 percent preferred on-premise deployment solutions, citing security and customization needs. Since data is stored on-site with this form of deployment, there are fewer transferrances of that data and it is typically considered more secure. Because the user can build their own infrastructure, there are also more options for customization — if they don’t mind footing the bill. The 13 percent of CMMS buyers who wanted on-premise solutions is much higher than what we saw previously in our HR survey and CRM survey. This is possibly because CMMS software buyers may be buying their first software ever: 41 percent said they were purchasing their first CMMS system. Storing data in the cloud can be a daunting prospect if users aren’t familiar with the industry. There could also be a demographic element to it. Many organizations that utilize CMMS software cater to and employ blue-collar labor forces and unions that have historically had a wary relationship with new technology. If you’re worried a computer will take your job, you’ll be less likely to trust a computer — much less this “cloud” thing — with your sensitive data. Buyers aren’t willing to cede control over who has access to the system: 47 percent of buyers wanted role-based access that would allow all workers to open work orders and only admins to close them out. Buyers may want automation of some CMMS functions, but they aren’t willing to sacrifice any control to get it. The only four CMMS software features requested over 50 percent of the time were the four basic tenets of CMMS: work order management, preventive maintenance, asset management and inventory management. This tells us something interesting about CMMS buyers. They don’t need flash and flare, and they aren’t looking for anything fancy. They want a system that’s going to get the job done and not charge them an arm and a leg to do it — something software vendors should keep in mind when catering to this market. That being said, it may also be true that buyers are under-informed about the more advanced options a CMMS application can offer them. Despite their aforementioned desire for control, only 10 percent asked for reporting capabilities. Business intelligence is an element of software that seems to be undervalued when it is a function of non-BI software. Everyone can benefit from BI features, but surveys like this are suggesting buyers aren’t totally aware of that fact yet. Want to find out which platforms offer what features? Check out our comprehensive CMMS comparison chart. The top three most-requested features were work order management (requested by 86 percent), preventive maintenance management (71 percent ), and asset management (69 percent). Of the companies interviewed, 52 percent asked for inventory management and 47 percent wanted role-based permissions. Predictive maintenance was requested by 23 percent, another 23 percent asked for purchasing functions and 15 percent wanted mobile access capabilities. These features weren’t in the top eight, but they were popular enough that we thought they were worth mentioning. A vast majority of buyers want the basic CMMS systems features that streamline their maintenance processes. But there were also some stand-out requests that give us a little more insight into their needs and goals. The number of users who will utilize the CMMS varies widely company-to-company, and the overall company size did not directly correlate to how many users would need access to the CMMS. These users were broken into admin and base users 23 percent of the time, further emphasizing the buyers’ desire for control via hierarchical access capabilities. The majority of buyers were updating a CMMS program they have been using to a newer or more robust model. Almost as many buyers were purchasing their very first CMMS and upgrading from Excel spreadsheets or pen and paper. The 3 percent downsizing and the 10 percent consolidating were trying to simplify, streamline and centralize their operations. The majority of buyers were open to either deployment option and said they would choose whichever form of deployment best suited their needs. A close second was those who prefer cloud-based — this is becoming the norm for most software, so it’s really no surprise. As mentioned above, 13 percent of buyers wanted the control and security that comes with on-premise deployment. It shouldn’t come as a surprise that CMMS buyers are committed to being prepared and in control, but it’s good to know. Any CMMS package that doesn’t offer these features may want to reconsider their system to appeal to the largest pool of potential buyers, and buyers who haven’t considered every feature other buyers requested should do some research to make sure they get what they actually need. The fact that buyers are more interested in basic CMMS functionality is important for vendors and third-party buyers to be aware of. This can ensure that they don’t offer CMMS systems bogged down with bells and whistles when that isn’t what customers are looking for. Conversely, if there is a more advanced CMMS feature that a user doesn’t understand, education about the importance of those features (like reporting) could potentially begin to shift this trend. Overall, this is a down-to-earth group of people who just want to make their maintenance management process easier, and they should be catered to with that in mind. What do you think about these statistics? What do you need in a CMMS tool? Let us know in the comments! Computerized Maintenance Management Systems, better known as CMMS software, isn’t simply something you should have – it’s a paramount part of your business and how you should expect it to operate. With premier CMMS software at the helm, you’ll be able to specify your needs and find the perfect work order software for you. Couldn’t agree more. Thanks for sharing!